A curious article appeared today on the Bold.global website, entitled: "It’s Been A Depressing Political Season, But Masonic Leaders Remind Us Peace is Possible" by Hayden Williams III. It contains an interview with the Past Grand Master of the Grand Lodge of California, MWBro. Russ Charvonia. On the one hand, I'm all for a call to civility in the U.S., and the world, for that matter. There's too little of it these days, and the anonymity of the web has made things even worse, allowing total strangers to erupt in ways they would never do face to face. Increasingly, we all seem to be shouting at each other, and branding argumentative opponents as the enemy. The bizarre construct of "hate speech" laws in some countries to brand uncomfortable rhetoric as a crime is an outgrowth of this. Even universities, which were once bastions of open dialogue and opposing opinions, are now turning into philosophical gulags where some students feel they must be protected from speech itself, and speech codes and trigger warnings now govern what a professor may say or teach. So, civility was the theme of MWBro. Russ' during his time in office - he has written about it (as DGM in 2014), and even issued a month-long "civility challenge" to California Masons in May 2015. Now, on the other hand, there's this article today on Bold.global. PGM Russ has done a dangerous thing as a Mason - talked to the media. In this case, the interviewer wasn't anti-Masonic, which is refreshing these days. But he did have a very clear and distinct agenda. As the June 7 presidential primary approaches for the Golden State, members of America’s oldest fraternity, Freemasons, are speaking out against the tone of the presidential elections. A society woven into the fabric of American history, Freemasonry seeks to develop leaders through its central tenets: brotherly love, relief, and truth. Bold interviewed the most recent Grand Master of the Grand Lodge of California, Russ Charvonia, about the state of the nation from a Freemasonry perspective. This presidential election has been dominated by narcissistic personalities blatantly using American democracy as a personal showcase. Donald Trump has degraded women, minorities, and the profession of public service all in one bow. The truly alarming aspect of this is that millions of Americans are supporting this kind of showmanship, signaling a great sickness being reborn from America’s past ghosts. When asked about his opinion on the pulse of the nation, Charvonia said that the country needs civic society groups including Freemasonry like never before. Charvonia said the world’s most powerful office needs a statesman. It needs a leader who can speak directly to the heart of a raging planet, and an egocentric politician will only throw gasoline on a raging inferno. Freemasonry is built upon a system of brotherly networks, all working towards a common goal. In a time where emotions are high and the stakes of national security are even higher, the ability to influence others to work together as a unit may be the most important qualification of the next POTUS. Charvonia knows this all to well. While heading an organization with more than 4,000 positions of leadership, his success came from having dialogue–not arguments–when making decisions for the future of this vast organization. Recent national events show the country’s negative racial undertones are as high as ever, and Trump’s basis of power resides within this matrix. Charvonia believes that Freemasonry tenets may have to return and bring civility to this morally wounded nation. We must engage in dialogue, and not debate. Debates require a winner, in which the pendulum of revenge and envy swings continuously. Dialogue brings opposing views together, while allowing compromise to manifest itself for the benefit of harmony. The Republican presidential race has resembled a playground shouting match using “yo mama so fat” punch lines. As a result, the American people imitate such behavior, destroying what little values people still possess. California Freemasons have seen a resurgence of young men ages 18-30 joining their ranks. They are openly rejecting today’s loud, bitter status quo for a brotherhood steeped in mystery and knowledge. While media has done much to tarnish its image, the tenets that the institution stands by has produced some of America’s greatest leaders in various arenas. It is this reason why Charvonia said he feels Freemasonry must lead the charge restoring America’s civility. Currently, Freemasons from California are leading a call for dialogue discussions in racially divided cities such as Ferguson, Mo. They are becoming more publicly accessible to attract those who are fed up with seeing America’s spirit digressing into chaos. When primary day arrives in the Golden State, California Freemasons will vote for the candidate who shares the same values they believe in, rooted in truth. 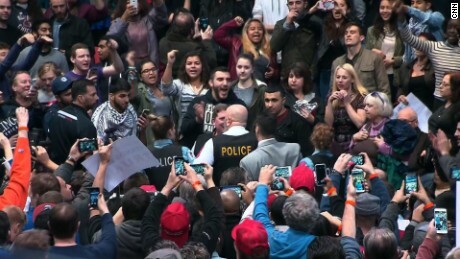 Unequivocally, that candidate will not be Donald Trump. Now, I don't disagree that Trump specifically has brought a major clot of coarseness to the presidential race. And I pray that if he actually becomes president that some level-headed advisor or Secret Service agent wrests his cell phone and Twitter account away from him before he Tweets some 140 character zinger off to Xi Jinping that gets one of our aircraft carriers slammed with a cruise missile over it. I think MWBro. Russ' goal of striving for more civility in the public arena is a noble one that should be pursued. As Masons, we strive to be tolerant and civil to each other and the world around us. But this story seems to be claiming that he is saying who Masons in California should not vote for, because of "civility." That's the kind of position that groups like the Grand Orient of France take, and staking out public position papers on political topics is one of the several reasons they are not widely recognized around the world. 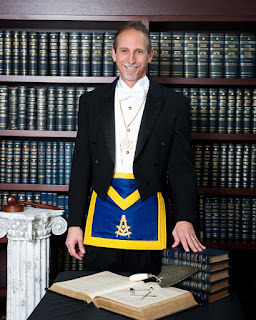 When a current or even past Grand Master walks into an interview with his apron and gold collar, he is speaking as a leader of all of his members. But if he wants to take a personal position on a public policy or societal matter, or just that he "feels the Bern," take all that stuff off and just be a concerned citizen who happens to be a Mason. The author of the article contacted me on Facebook, and admitted that the commentary specific to Trump were his own opinions, and NOT those of the PGM. After the discussion, he went back and revised the last lines of the piece to reflect that. And the PGM himself also sent a message saying the following,"To be clear, I did not mention Mr. Trump's name to the author of this article. That was Mr. Williams' conclusion, not mine." Bro. Chris, I agree with you completely. As one who often writes about politics--which will only happen more frequently in coming months--I make it a point to strictly segregate my politically oriented posts from my posts meant specifically for a Masonic audience. And that is how it should be in our fraternity. One of the first lessons taught to me during the ceremony of becoming a Master of a lodge prior to my installation was to NEVER split your lodge by voting on a resolution yourself or taking sides in a contentious debate. (Your state may differ in its admonitions.) The lesson was taught by arranging for a vote to be split down the middle, and forcing the Master to take sides, whereupon half of the room walked out. It was a powerful demonstration of how quickly you can turn members against you. It's about time an American Freemason of some authority demonstrates character. Thank you MW Brother Charvonia. Unequivocally! I'm not going to let this degenerate into a pro/anti Trump train wreck. On facebook, I have had a back and forth with the author of the piece who is himself a Mason, and he says his piece was not meant to imply the GM had a stated position on Trump one way or the other. The remarks specific to Trump were the author's opinion. As such, it should have been identified as an opinion piece, not an interview. To be clear, I did not mention Mr. Trump's name to the author of this article. That was Mr. Williams' conclusion, not mine. The United States does not have "hate speech" laws. I have no idea where you came up with that. Sorry, I was writing in a hurry. I meant to say "in some countries." Fixed. Oh, perhaps I should have guessed that. Sorry! Russ and other grand lodge grandees: Luke 4:23 Physician, heal thyself. Brother Russ as grand master did nothing about the southern racist grand lodges, the dubious African grand masters, the discrimination against Jews by some grand bodies, and is well aware that the California school programs will be destroyed by those black marks unless something is done. Action against Georgia and California is only a half step. Taking a victory lap at Demolay banquets and Eastern Star balls and a public relations civility talkfest should be replaced by getting the fraternity in step with a country that needs a real civility achieved by rooting out racism such as masonry's. You cannot expect people to be civil when they see groups like the masons using their skin color and gender and religion against them. Come the autumn, will school superintendents want racist freemasonry giving out t shirts and pencils? How ridiculous to claim we are helping in Ferguson. The grand masters should be doing something about masonry in Mississippi. The media are like the conspiracy lunatics, who like to push the Taxil Hoax, and take many things out of context, along with quoting half-quotes, or quoting specific sentences, which they can turn around to make it sound like something different than what was actually said. I also noticed, that from the tone of the Bold.Global articles author, that they tried to make it sound as if Freemasonry would get involved in politics. That is conspiracy hogwash at its best. Ahh. An example of why we, as Freemasons, refrain from discussing the toxic brew of politics in lodge.